AFRICANGLOBE – Dangote Group is one of Africa’s leading industrial conglomerates, with interests in everything from cement to food. Yet one of the most promising ventures, in the eyes of founder, president, and CEO Aliko Dangote, is to develop Nigeria’s natural-gas sector into an export industry. 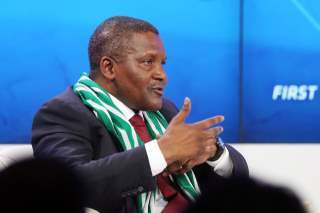 In an interview, with McKinsey’s Rik Kirkland, Dangote explains his plans for the Dangote Group’s oil refinery, his effort to build a company that will outlast him, and why now is the best time to invest in Africa. An edited transcript of Dangote’s remarks follows. The big growth opportunities for Dangote Group are mainly on the south side of Africa. We are thinking about how we can take this business from where we are today — with a market cap of about $25bn — to $100bn by the year 2020. Nigeria is very dependent on oil — 38% of the country’s imports are petroleum products. So we’re asking, “How do we monetise our gas? How do we get gas to other countries?” We’ve looked at what kind of refinery we would need to meet all the domestic demand and also to export to the others in West Africa. The refinery, with an output of 650,000 barrels per day, will be the biggest petrochemical complex in the world in one single location. It will cost $12bn to build, and will generate a turnover of $24bn per year. The other businesses that we’re in include sugar, wheat, flour, pasta, and cement; cement is the only business that we do in 16 different countries in Africa. The next sector that we’re planning for is fertiliser — urea and ammonia. We are building two plants: we’ll use some, and some of it we’ll export. In all, we will be making an investment of $16bn over the next three years. Africa is the best-kept secret. It’s true, there are risks. But you have to consider how to mitigate the risks and move forward. Africa, as a whole, has been growing by 5.5% a year for the past 12 years. And it has been sustainable. This growth, when you look at it, really is without power. With power, we could have double-digit growth. In addition, there has been a lot of political transformation. Various governments in Africa are making life easier, much easier than before. Our government used to change the rules of the game almost on a monthly basis, or even on a daily basis. That’s not happening right now. So investors can actually see what they will get over the next 10 years. Our banks, also are not the same. They, unfortunately, have not reached where they’re supposed to be, but at least you can get some funding. For example, in 2005, they had only about $25m of capital each; now it’s up to $250m of capital. Part of our innovation plan is to make sure that we have great partnerships. We have partnered with Blackstone to invest $5bn in infrastructure in Africa. What we would normally do is that we would take the whole risk first: Incubate these companies, make them work, demonstrate that they’re good businesses, and then we take the company to the capital market. But these days, before going to the capital market, we get some key investors. Then, together, we’ll make sure everything is in line. After that, we go out and list in Nigeria. Now we’re even thinking about starting to list on the London Stock Exchange. Another part of our innovation strategy is to re-examine our processes because the processes are very, very important and key in terms of making sure that we compete with the international manufacturing base, both in terms of quality and in terms of producing our goods in the most economical way. The final aspect of it is increasing the size of our business. Right now, we’re expanding to 16 other countries and we’re looking for more opportunities. The only way for us to do that is to digitise the business. We have a lot of information at our fingertips to make decisions — and to make the right decisions. What I was doing five years ago, if I tried to do that now without the automation that we have today, it wouldn’t happen at all.